Siraj Wahhaj of Dekalb and Clayton County Georgia has been sought by FBI and Law Enforcement for kidnapping his 3 year old son Abdul-Ghani Wahhaj since November 29th 2017, after a major car wreck involving 7 small children, and a woman named Maryam (Jany) Leveille. 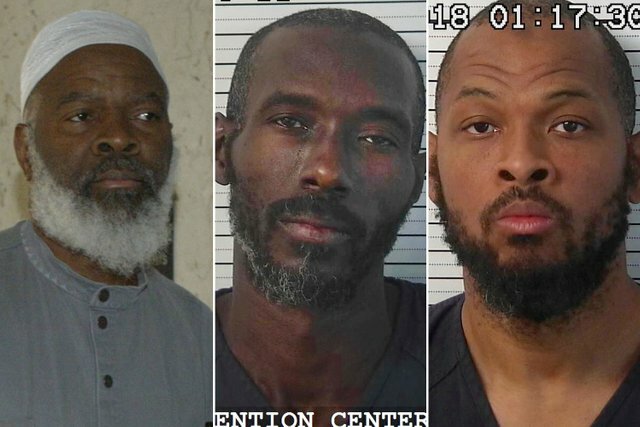 This past week, authorities found Wahhaj and arrested, another accomplice, Luqman (Lucas) Morton, and three women, including Leveille, at a rundown compound in the desert of Amalia. New Mexico. There, LE found 11 starving children who were all malnourished, seeking medical attention and placed in the care of Child Protective Services. This case is HIGHLY suspect in that LE already had the chance to rescue these children back on December 22 2017, when Wahhaj's vehicle was found overturned on I65 N in Chilton County Alabama. State Trooper J.W. EarnHardt said in the police report that Wahhaj and Leveille were on their way to go camping in New Mexico with 7 children, 3 handguns, 2 rifles, other contraband, and absolutely NO CAMPING EQUIPMENT WHATSOEVER. Not to mention, they said they were coming from Georgia, which means they made a possible stop if they were going to Amalia NM, leaving the major routes of I20/I65N in Jefferson County, which is around a 1 hour drive south. Wahhaj was brought to a gas station, and after only 6 of the children and Leveille were questioned by Earnhardt and checked out of the hospital, they were given back to Wahhaj, along with all his weapons, to wait for a friend in a box truck that Wahhaj wouldn't allow the officer to open... then on to the compound they went, without question or checking the FBI or missing children database. The plot thickens when you learn that Imam, the Elder Siraj Wahhaj from New York, an unindicted co-conspirator in the 1993 WTC Bombing and “prolific Muslim American speaker” according to his IMDB page, IS THE FATHER of the 39 year old Siraj Wahhaj. We are still looking into his connections in NY, NM, GA and other locations, but there are some incredibly obvious SRA components to this case. In one article by NewsDaily, they say the "elder" Wahhaj wanted to do an exorcism on 3 year old Abdul because he was supposedly possessed by the devil. In another article by AJC, the father of Abdul (the younger Siraj Wahhaj) had mentioned to his wife, according to a police report, Hakima Ramzi (Wahhaj), who originally reported him missing on November 29th 2017, said that her husband also mentioned doing an exorcism on his son before he and Abdul disappeared. NCMEC reported about Abdul being missing and possibly kidnapped by Siraj Wahhaj on December, but yet Chilton County Police in Alabama let Wahhaj slip through their fingers on December 22nd after the major car accident with Abdul in the car. According to NewsDaily article, 7 juveniles and 2 adults were involved in the accident, but in the same article it states that only 6 children and Leveille were taken to the hospital, and Wahhaj and Abdul, who actually has major special needs, were left on the highway to deal with police and taken to a gas station??? It was actually Jason and Tanya Badger, the owners of the land in Amalia where the compound resides, who did background checks on both Wahhaj and Morten in April because they tried to evict the group due to their concerns for the children and property disputes. They filed the eviction notice through the courts against Morten, who owned the land next door, but he had built the compound on their property most likely to conceal from any search warrant for Morten’s own land. The courts denied the eviction in June and when the Badger’s found out that Wahhaj was wanted by the FBI, they alerted authorities. Places to Find Info on Companies Related to Wahhaj and Others Associated With His Addresses. This is interesting. Does anyone know if Pearl & Norman Epstein are related to Jeffrey Epstein? Ever heard of the Order of AHEPA? They are directly connected to James Alefantis.